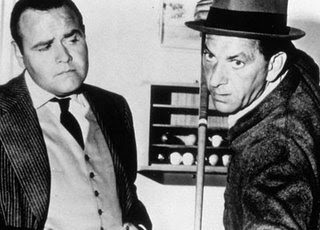 They just ran the classic episode "A Game of Pool", which originally aired on October 13, 1961. It's one of my all-time favorite episodes of The Twilight Zone, for a lot of reasons but especially 'cuz I thought the interaction between Jack Klugman and Jonathan Winters was brilliant! ...that wouldn't it be more awesomely cool than we possibly deserve, if somehow there could be a sequel to this episode made, again starring Klugman and Winters as Jesse Cardiff and Fats Brown? It could be called "Another Game of Pool"! Okay, that will probably never happen outside of the wonderful delirium of my dreams. But still, one can practically see it happening. What an amazing show this was. I even liked the later incarnations quite a bit, but Rod Serling's original series was, I'd dare say, the most influential and revolutionary television show in the history of the medium. I'm glad that I'm not the only one who has thought this too. There would be very few things that I could do professionally that would be as fulfilling as a chance to direct a Twilight Zone story with Jonathan Winters and Jack Klugman. And for good measure, Bill Mumy as well. This brings back a memory of when I was still living in Brooklyn. I didnt have cable tv and there was very little to watch on the free local broadcast channels. All the good stuff was on cable. Months would go by in between something good to watch. Om holidays (christmas, thanksgiving, new years), they usually ran a matathon on classic tv shows. The honeymooners, Star Trek, Twilight Zone, etc. I would tape these marathons so that in later months I would have something good to watch. I would tape The Twilight Zone marathon on New Years eve and months later, when I was starved for something good to watch, I would pop in the VCR my tape of Twilight Zone episodes.